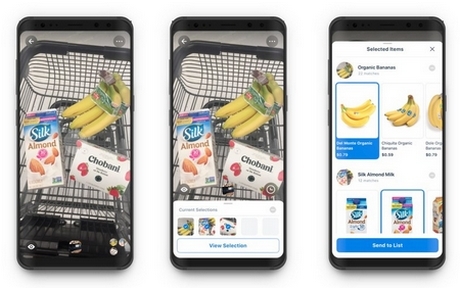 Slyce, which currently powers visual search for 60 retailers, announced that multiple grocery retailers are licensing its mobile SDK to power a list-building experience in their apps. Using Slyce's "batch capture" mode, a consumer can build a list by scanning barcodes, product labels, or taking photos of foods without barcodes (such as fruits and vegetables). Retailers are leveraging visual search to help customers build shopping lists and order from home, as well as enabling "Scan and Go" self-checkout in store. The most recent partner is ALDI Süd, the German supermarket chain with more than 9,000 locations, which picked Slyce to help re-invent the in-store customer shopping experience. Slyce also announced the acquisition of the software assets of Hiku, an innovative startup that created a voice-enabled handheld scanner for building shopping lists at home — Hiku was the forerunner to the Alexa-enabled Amazon Dash Wand. While Hiku initially sold devices direct to consumers, Slyce acquired the software assets and intends to shift to offering a white-label solution for grocery retailers—who can utilize the technology inside a mobile app, or as part of a white-labeled device provided directly to their loyalty customers. "Supermarkets are the next frontier for visual search," said Slyce CEO Ted Mann. "Populating shopping lists on your smartphone is difficult and time consuming. With visual search, we can reduce the time required for a customer's first mobile order from 20 minutes to less than 1." Mobile barcode scanning is one of the grocery problem sets that Slyce is also tackling. "One thing that impressed us about Hiku was that their barcode recognition and matching was flawless," said Slyce CEO Ted Mann. "We tested dozens of grocery retailer apps, and those that have barcode scanning tended to match products less than 50% of the time. It's not a matter of the barcode detection failing, but rather the ability to find an exact or similar match in the retailer's database. It's a huge problem, and Hiku nailed the solution." Mann confirmed that the Hiku barcode tech, currently utilized by online grocery-ordering service Shipt, yields a 97% match rate for in-store scanning — 2-6x the rate of all grocery apps that were tested. Slyce will be demonstrating the new grocery and list-building capabilities at Shoptalk in Las Vegas (booth # 4133).